The product featured here is – in my opinion – a complete waste of natural resources and manpower. Please do not buy one or any other worthless product of this nature. All you really require to crack or separate an egg is an egg! I always find it useful to have a narrow edge, such as the rim of a glass, to crack the egg on. you are showing up as a new commenter so welcome to my blog if you are, although I have a feeling you may have been here before. I was watching a cooking show recently and the chef said that to break your egg on a flat surface is more effective because it creates a round crack which is easier to get your thumbs into. I have been doing it this way ever since and I think he may be right. How does one get to the age of 45 without really thinking about something like this. I have used both methods over the years and hadn’t even considered that one might be better than the other. Test it out and see what you think. Hi Colleen, you are right, I am new here. I tried cracking an egg on a flat surface and it didn’t work for me and logic suggests to me that a sharp egg makes a neater break. I don’t have any trouble opening the eggs, but I think I use fingers rather than thumbs. The other reason I use a glass is because there is always a risk, however slight, of an egg being bad and cracking each egg separately into the glass before adding it to your bowl means you want contaminate good eggs if you do have a bad one. I’ve been cracking eggs for longer than you and this method works well for me. Keep on dropping in we appreciate your input! That is definitely kitchen clutter. It’s also one more thing that needs to be washed after use, easily the worst part of the cooking process. Did you notice the “Free” egg yolk catcher, haha, that’s classic marketing for the masses! I’ve been tending to steer clear of “free” as it’s a dead giveaway that the item is clutter material. I agree with you on all points. finding all the parts and washing after use probably negates it “usefulness”. You have got to be kidding?! Is there really something this stupid out there? You have to wash it!! And store it!!! All just to crack an egg?! What is this world coming to?! My grandma use to say “hands came before forks.” They came before egg crakers too. I think there should be a law against this don’t you think so too? It should be deemed a crimes against the environment. For those of us with two healthy hands, this may seem like a totally stupid and useless item. No, I would not one in my kitchen, but… Having worked with people with disabilities, I know that sometimes these type of “stupid” items can make a big difference in their lives. Would you be able to separate an egg with only one hand? I can’t even crack an egg with one hand! Initially, I though this might be a useful tool for some patients, but when I did some research, I found out that you need two hands in order to be able to put the egg between the loops. Not so good item after all. I hope I don’t offend anyone with this comment. I just wanted to point out that sometimes some items are more useful than you would think at the first glance. I am sure you wouldn’t offend anyone with this comment, certainly not me. You have a strong point here about being useful maybe for people with a disability but I am sure there is a way to access a catalogue of items like that while this hideous thing was being advertised to the masses through television. I am sure, sadly, that they will sell millions of them. If you haven’t already, you should check out the unclutterer blog’s unitasker Wednesday series. It has an item like this every week, and there are more of them than you would believe. 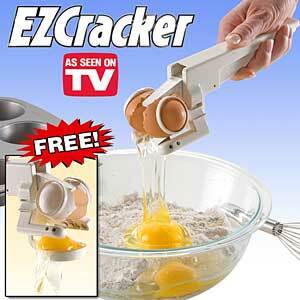 Also if you haven’t seen it, you should check out the infomercial for the ez cracker. It is hilarious the trouble they show ordinary people having with cracking eggs. Here is a youtube link. I don’t believe you have commented here before so welcome to 365lessthings. 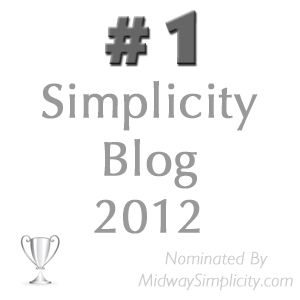 You clearly check out other minimalist sites so I am sure you have lots of great info to add to our conversation. So thank you for dropping in and do come again. I have looked at unclutterers unitasker Wednesday before and I also looked at some youtube videos before I posted this. I am supposed to be taking the weekends off so if I do post anything it is short and I spend no time adding links and things so thank you for added to this conversation. I watched the video Jenny. Thanks for linking to it. I’ve never seen so many incompetent egg crackers before. What a pack of klutzes. But here’s what really made me laugh: the woman whipping her meringue with a whisk! Do you really think a person who can’t crack an egg with her bare hands is going to 1) make a pie at home and 2) cover it with hand-whipped meringue??? Kind of reminds me of a toilet paper holder I once saw. It was a wand with a claw at the end where you could wedge the paper. It was being advertised to those who were too overweight to reach behind themselves and to people who were just too squeamish to get near to their own poo. It’s real usefulness, I would think, would be to people with shoulder mobility issues. For these folks, such an item could be the difference between taking care of their own toileting and needing assistance. But once it’s marketed to everyone, the wheels have fallen off the bus, as far as I’m concerned. OMGosh! How ridiculous is that? I’ve spent the past year getting rid of clutter, a lot of kitchen clutter especially. But, even with all the clutter I had, I didn’t own anything as silly as that! The sad thing is, people actually buy such things. I hope the flood situation is better in your part of the world! kitchen clutter is insidious with marketers praying on overworked housewives and house-husbands who just want to make their lives easier. As for the floods, well they are dropping in some areas and starting up further down the continent, Victoria, South Australia and Tasmania and I think even parts of Western Australia are getting it now. What a mess! But us Aussies are made of tough stuff! Spare a thought for the 500 dead in Brazil and Sri Lanka are suffering at the moment too. Old Mother Nature she can be cruel at time but she makes up for it in so many ways. I am interested to know if you agree with me on whether garlic crushers are also a waste of time. I always use fresh garlic these days and only ever use a knife to prepare it. I have used garlic crushers before and find them to be a real pain to clean and so I decluttered mine. Do you agree? I have been a sucker for kitchen gadgets in the past but usually only ever bought them at garage sales for a dollar or less. I would try them out and if I found them unhelpful I would sell them on at my next garage sale, no harm done. I did find the odd keeper among them at times and those are still in regular use like my whipped cream cylinder, I love it and the cream stays fresh longer in it so there is rarely any waste. Yes, I got rid of my garlic crusher too – partly because it was so picky to clean and also because I rarely use garlic nowadays (became more and more averse to the taste, aftertaste, and morning-after taste!!). The odd time I do use fresh garlic, it doesn’t seem like rocket science to prepare it with a knife. Great idea to get gadgets at yard sales if you want to try something new on the cheap. It’s Saturday night and this week’s Mini Missions are done! Yippii!!! One shirt returned to the store, 20 pens thrown away, manuals put in order, hair accessories sorted out and one glass vase from the display cabinet donated. Fridge door is clean and since I don’t have a garage I have tomorrow off! 🙂 Can’t wait to get next weeks Mini Missions! Wow, Anne, I’m impressed! You’re reminding me how easy it is to do so much in one week, a little bit each day. I’m looking forward to the mini missions next week too. Like Anne, I was wondering if the tool would help people with a disability, but evidently not. Because my mom had lupus and couldn’t grip anything or hold anything heavy, she used an electric can opener–that is one of the kitchen accessories that actually helps a disabled person. And Freedom, I agree with your assessment–you’d have to wash the thing after using it–just too much work and fuss! Jo put it so well, I also rarely use anything more than the basic knife, spoon and cutting board. No garlic crusher here either. I thought of this stupid thing this morning. I hit the egg on the side of the bowl, it broke cleanly in half, and half dropped right into the bowl. “That was wierd,” I thought as I fished it out. Second egg, same thing. Genetically modified to crack cleanly? ?